This peptide is one of the most popular in bodybuilding. Alone with growth of muscle mass and strength, it has additional profits: it increase immunity, improves skin, hair and nails health, improves sleep quality and increases life energy. The effect of CJC-1295 DAC is comparable to that of artificial growth hormone. This is a powerful drug for pharmacological tanning and treatment of erectile dysfunction and loss of appetite. It’s a synthetic analogue of the natural melanocortin; it has aphrodisiac properties. Melanotan 2 is widely used in cosmetic and medical purposes, which is yet more proof for its high efficiency as a skin protective drug. Ipamorelin is an effective stimulator of the growth hormone production which even at high doses hardly induces prolactin and cortisol. It’s the most powerful drug of the GHRP group. The main difference of Peg Ipamorelin from the usual Ipamorelin is in the duration of action. Due to the addition of the Peg-element, a half-life of the substance extends up to 7 days. Injections of the drug are carried out once in 2 days. Peg Ipamorelin has a high anabolic index and is the most powerful drug of the GHRP group. Gonadorelin naturally activates the production of endogenous testosterone, which has several advantages over artificial one, such as absence of estrogens, flavoring and filling. To increase the levels of testosterone, you should use pulse therapy. The drug is similar to Melanotan; it also increases the production of melanin, but the main task of the drug is treatment of erectile dysfunction and sexual disorders. It is a highly glycolized peptide that inhibits the gonadotropic function. Using follistatin increases the size and strength of muscles by blocking the myostatin protein (GDF-8). The drug is a promising therapeutic strategy for the treatment of musculoskeletal diseases, focusing on myostatin, a negative regulator of the muscle growth. 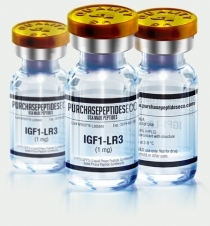 IGF-1 LR3 has a high anabolic index. Muscle hyperplasia is a main effect of the drug. As studies have shown, hyperplasia manifests itself even in the elder athletes. Bodybuilders must take this drug.